The Baked Tile Company were setup by a team of interior designers, who wanted to supply a tile range that injected unmistakable personality into all manner of design schemes. Their request was to have an ecommerce website that represented this design flair; one that was easy for customers to navigate, but was on-brand, image led and had a fun and enjoyable look and feel that pushed customers' creative side and vision for their home. In addition, they wanted to push social media, to both potential customers and other interior designers, using fabulous room imagery to inspire and engage them to share the designs. 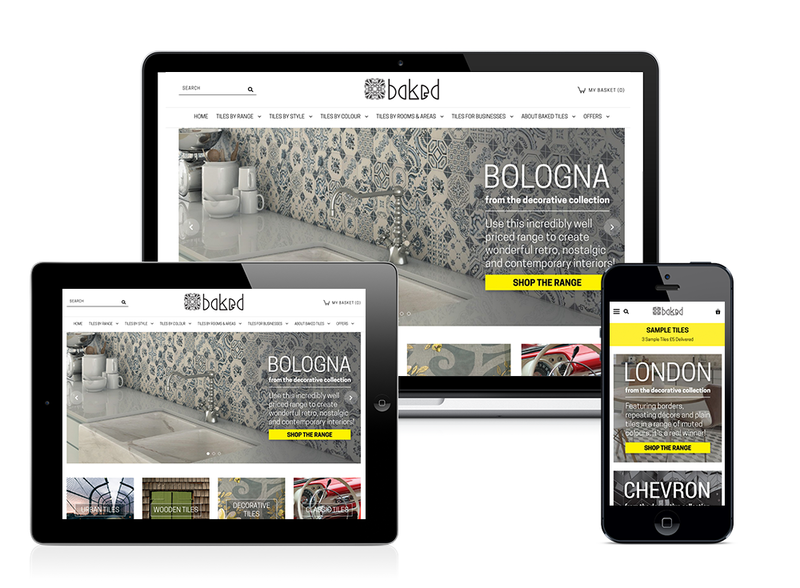 Baked Tiles' ecommerce website was designed to be a continuation of the brochure and showroom, showcasing fantastic imagery and inspirational tile ranges for customers to discover. Buying tiles can be an expensive and research-heavy activity, and it can take a number of months to go from research to purchase. The Baked Tiles website allows customers to explore and find tile ranges that match their requirements, whether they are looking for tiles by a room or style basis, the navigation is intuitive and simple. It was imperative the website worked well on mobile, given much research in the modern day takes place on mobile devices. Lastly, the website had to provide the customer with an easy way to order sample tiles, again given that this is a necessity within the industry to see and feel before you buy. We developed a digital growth strategy for Baked Tiles that included a content that provided regular and relevant new pages on the website. Social media campaigns on Facebook, Twitter, Instagram & Pinterest to increase brand awareness. Ongoing conversion rate optimisation, ensuring the website provides the best user experience.